As technology progresses and we are able to produce machines that look and act almost like sentient beings, it becomes more and more difficult to tell the difference between biology and technology. The Life Writer project from Christa Sommerer and Laurent Mignonneau is a strange but highly entertaining commentary on the scientific origins of modern life. The project uses an antiquated device – a typewriter – to create futuristic new life forms. 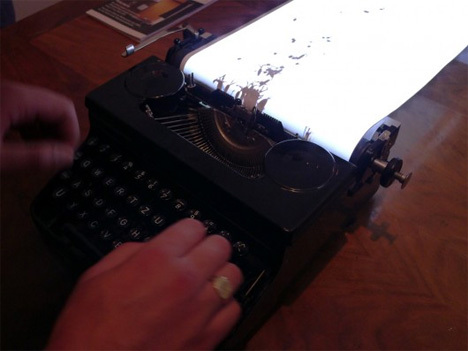 A projector is trained on the plain sheet of paper that has been inserted in the typewriter. As a user types out the first line of characters and presses the carriage return, the characters appear as tiny life forms. 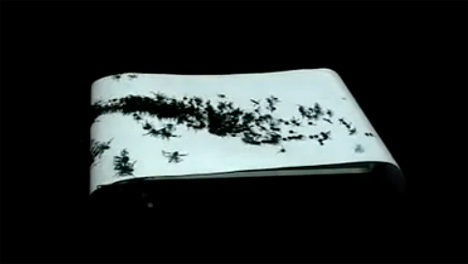 The bug-like creatures’ characteristics are based on an algorithm where text is used as a genetic code. As the user types more text, the hungry creatures gobble up the new letters and grow, then breed. The new generations of critters are created based on their parents’ characteristics, just like in biological evolution. Eventually, the screen becomes filled with scuttling creatures that dash to any new typed characters and devour them immediately. The user can control their movement somewhat by turning the typewriter’s cylinders: moving the paper forward pushes the creatures away while moving it backward can crush them within the typewriter’s parts. The user gets to play god in a way, creating new life over and over and then deciding whether to let it live. This technological evolution is reminiscent of the way we create and then refine (many times over) our man-made technologies. See more in Art of Tech or under Technology. August, 2011.